Prebiotics Elderly Supplements: Are They Suitable for Older People? Nutritional supplements formulated for the digestive system have become popular, particularly those that contain prebiotics. Elderly consumers are some of those who are reportedly in need of such supplements, given that digestive abilities decline as we grow older. But are prebiotic supplements suitable for older people. Let us find out. As we grow older, we become more prone to certain illnesses, particularly those that have something to do with our digestive systems. Digestion is more difficult for older people so they are more likely to suffer from under nutrition, diarrhea, constipation and weaker immune system, with the last also associated with digestive problems. According to elderly health experts, these problems usually come because of the changes to our bodies that occur when we get older. The medications that older people usually take to address various health problems may also contribute to digestive problems, as well as the lack of exercise or activity. Low fiber diets and low water intake are also factors behind these illnesses. The food ingredients known as prebiotics have been suggested to help alleviate some of the digestion-related problems experienced by older people. Prebiotics are non-digestible food ingredients or dietary fibers whose main function is to induce the growth and activity of friendly bacteria inherently present in our digestive tracts. They are resistant to heat, cold and have long shelf lives. The fact that these dietary fibers are non-digestible makes them even more effective since they remain unaltered even after undergoing treatment or after being processed. They are also known for inducing metabolic activity which will be good for elderly people whose metabolism has slowed down. Prebiotics can be found in a number of plants, including artichoke, asparagus, kiwi, onion, garlic and leeks. Ever since research studies have emerged touting the digestive health benefits of these food ingredients, manufacturers have increasingly added them to daily food options, like cereals, bread, biscuits and other food products. They have also been used as primary ingredients for nutritional supplements specifically formulated to promote digestive health. There are a number of these supplements currently available in the market, although they differ in their base ingredients and in the manner by which they were made. Probably the most suitable option out there right now is Kiwi-Klenz. 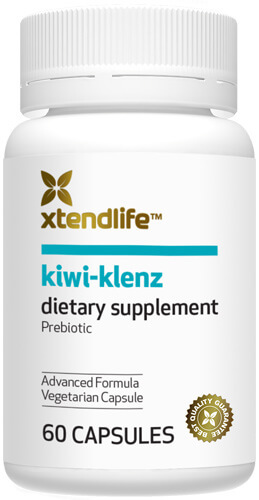 This prebiotic nutritional supplement from Xtend-Life is made from kiwi fruit, one of the best sources of prebiotics. It differs from other nutritional supplements that make use of kiwi because the skin and the seeds of the fruit are included in the manufacturing process. This is highly beneficial since the bigger part of the nutrients and prebiotics that can be found in kiwi are in its skin and seeds. In addition, the formula is balanced by the presence of phenolic compounds, enzymes and soluble fibers. These four elements are necessary to keep the digestive system well-balanced and healthy. In other prebiotic supplements that make use of kiwi, the seeds and skin are thrown away and the pulp is the only part that is retained. This diminishes the enzyme level and the prebiotic content of the final product, thereby lowering its efficacy level. Unlike most supplements, Kiwi-Klenz also does not have chemical additives and is made from all-natural ingredients. It is ideal for everyone, including older people with digestive problems. The vegetarian capsule is easy to take and since the supplement is tasteless, there is no worry that it will not go down easily. Prebiotics elderly supplements, likeKiwi-Klenz, can help alleviate problems related to digestion commonly encountered by elderly people, although they are also suitable to children and adults.